May I speak in the name of God, Father, Son and Holy Spirit. Amen. Welcome to this beautiful service in this beautiful cathedral among multitudes of God's beautiful children, all of us made in God's image. This is one of my favourite nights of the year, a night on which I feel a certain magic. I'm not sure whether it's the spirit of kindness I feel emanating from all of you, or the joy I see in the eyes of our children, but whatever it is, this time of year always puts a smile on my face, especially when the sun goes down and the night comes alive with the twinkling of the Christmas lights. And this Christmas, I also feel a renewed energy in our country, a little like the way I felt when our children took us a few weeks ago to the Global Citizens' music festival in Johannesburg. (Although I have to admit that I couldn't stay long enough to watch Beyoncé!!) This Christmas, I believe we’re about to re-enter a new age, an era where we define the new South Africa. 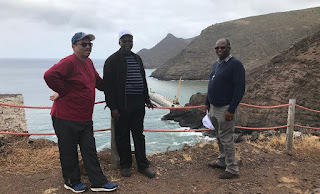 As this edition of Good Hope went to press, I was on the island of St Helena in the South Atlantic Ocean, where I and two of my fellow bishops consecrated the new Bishop of St Helena, the Right Revd Dale Bowers. 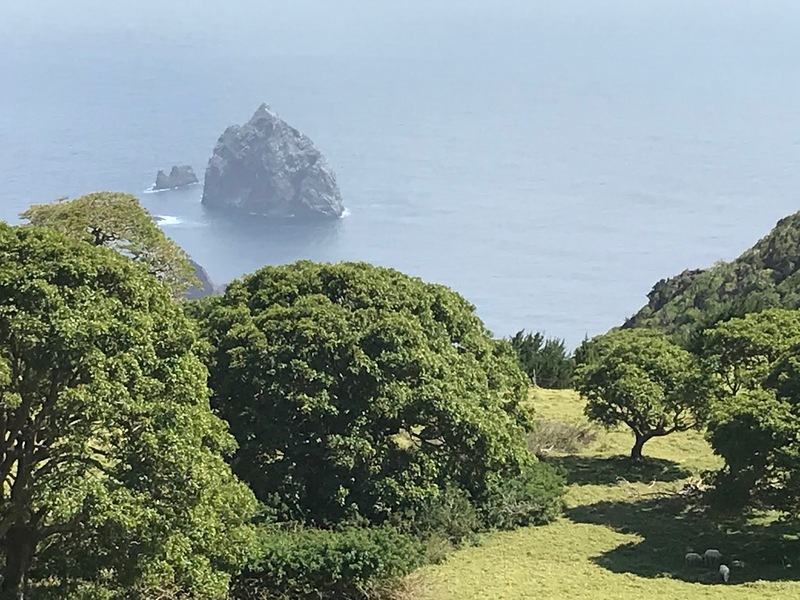 St Helena is part of the Anglican Church of Southern Africa which in the past has received less attention from the Province than other dioceses; its remoteness making it accessible until now only in weeks-long voyages by sea. My visit is the first undertaken by the Metropolitan in more than 30 years, and as far as we can establish a bishop for the Diocese has never before been consecrated on the island. 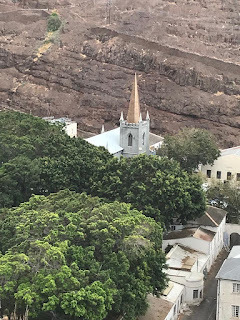 Yet Anglican ministry in our Province began on St Helena: the first Anglican chaplain was appointed in 1671 and St James' Church in the main centre, Jamestown – where we said Morning Prayer on the day of the consecration – is the oldest surviving Anglican church in the Southern Hemisphere. 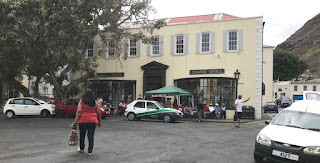 The Diocese, which includes a parish on Ascension Island, is the fourth oldest in the Province, after Cape Town, Grahamstown and Natal. Bishop Dale with the Archbishop. So it was a special joy to be able to take advantage of St Helena's newly-built airport and to fly there with the Dean of the Province, the Right Revd Stephen Diseko of Matlosane, Bishop Allan Kannemeyer of Pretoria, and my chaplain, the Revd Mcebisi Pinyana, for the consecration. The consecration service took place on November 11, so it was also preceded by a civic Remembrance Day service in which we commemorated the end of the First World War exactly 100 years earlier. 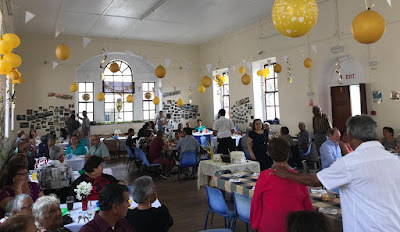 The local Catholic Church hosted an ecumenical lunch to welcome us and to honour Bishop Dale. He is only the second of the 16 bishops of the Diocese actually born on the island; please pray for him, for his, wife, Penny, his family and for the people and clergy of the Diocese. 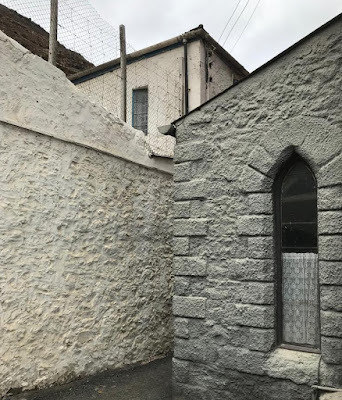 Turning to more solemn Provincial matters, our only institution for full-time residential training for the ordained ministry, the College of the Transfiguration (Cott) in Makhanda (formerly Grahamstown), is undergoing serious financial trouble. So I am issuing a special appeal to parishes as your Archbishop: please make a special love gift to Cott this Christmas. You can send it to Canon Charleen van Rooyen, the Diocesan Administrator. Also, you don't have to be selected and paid for by a Diocese to study at Cott; anyone with an interest in getting a sound theological training – for example, a retired layperson wanting to study further – is free to apply to study at the college, even if it is not with the intention of being ordained. Also as we went to press, the sad news came in that Mrs Tobeka Mzamane, wife of Bishop Sitembele Mzamane, formerly Bishop of Mthatha, Dean of the Province and in retirement Vicar-General of Mzimvubu, had collapsed and died. 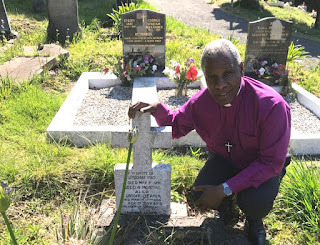 Also, Bishop Stephen Diseko, currently Dean of the Province, lost his sister, Elizabeth. Please hold them and their families in your prayers, and we send our condolences and messages of comfort to them. In the Diocese, you will by now know that Bishop Garth Counsell retires at Easter next year. He will be on sabbatical from December until February, so I will be appointing a Vicar-General in the interim. I am already suffering “termination anxiety” at the prospect of his retirement; I have really loved working with Bishop Garth and have felt upheld and supported by his ministry and leadership. I hope that God will send us another servant as loving, faithful and able. A number of farewell functions are being planned to thank him and Marion for their love and service to this church and Diocese. 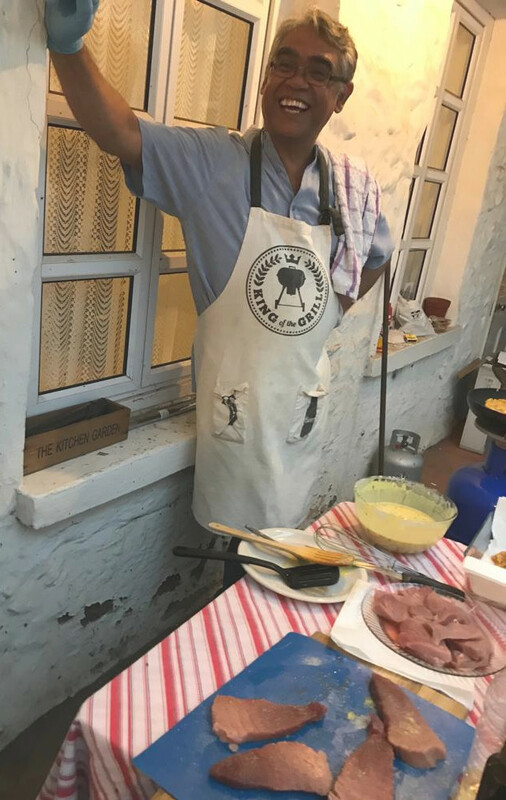 His annual end-of-year dinner for the clergy turned into something very special – a kind of going-away dinner for the Counsell family. Thank you to those who arranged it. As we wind down for the year and Christmas approaches, my warm thanks to everyone on the staff of the Diocese and at Braehead House and Bishopscourt for their dedicated service to the Diocese and Province this year. I wish you all a peaceful and merry Christmas and a blessed New Year. May our New Year's resolutions be about loving God and our neighbours as ourselves, and treating the environment with care and compassion. Last night we had dinner at Wellington House and Bishop Dale came to assure us that the plane was on schedule for today. After a good tuna steak and rum-and-raisin ice cream, we walked home. This morning was a bit warm and up until 10:30am we had a bit of sunshine. Town is buzzing with people, reminding me of the little town of Grahamstown on a Friday, full of energy. The numbers of people are far lower here but the spirit is the same. We walked up Main Street and along the Jamestown harbour and met more people wishing us well with our flight today. 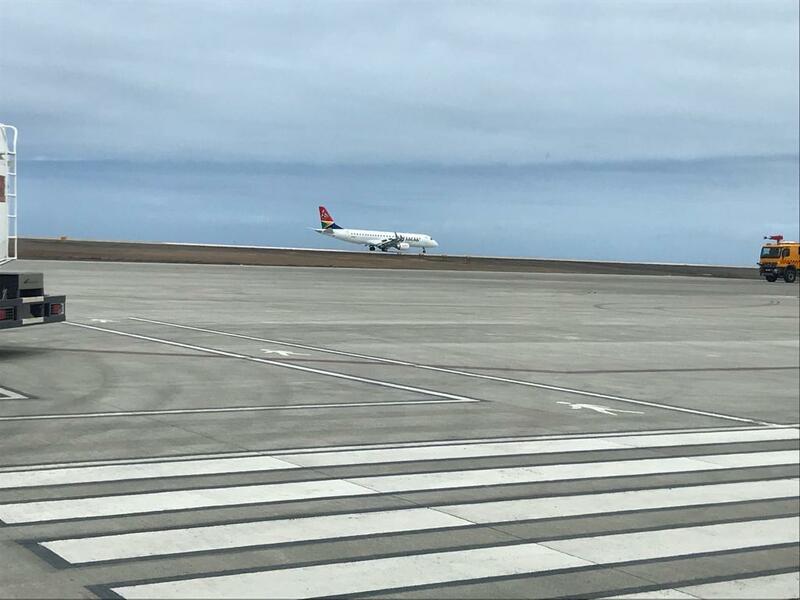 The news is that flight has left Windhoek on its way here and we hope in the next four hours there are no dramatic weather changes. Packed at our hotel and ready to go. To the airport - it's cloudy, but not too windy. 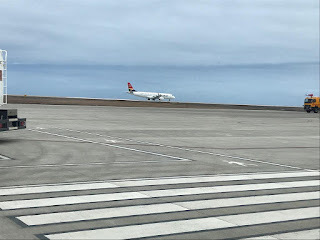 St Helena's runway is exposed to what pilots call "wind shear". Alleluia! The plane has landed. 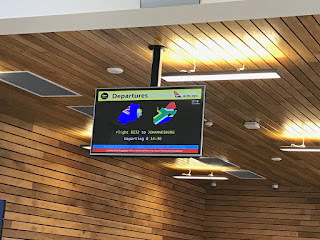 We landed at OR after 10 pm tonight... Now back to Cape Town to sort out my disrupted schedule and reconnect with my family. Brother clergy climb Sister's Hill. At 7:30 we joined the weekly Mass at St James, celebrated by Bishop Dale, then had breakfast. I had run out of hypertension medication so my chaplain, Mcebisi Pinyana, and I enjoyed a walk through light drizzle to the hospital pharmacy. On our way back, an old lady ran across the street and said Eric had books I was looking for. This is how news travels on the island. The books were piano lessons for beginners. I borrowed them and went to St James to practise the piano. Joy, my teacher in Cape Town, will be happy to know that I fitted in about 30 minutes' practice! I know it's a schlep for her to teach an adult but she is the best teacher for me. Back at my room I continued to read “Justice” by Michael Sandel, a recommended read indeed. Then I dozed off; I did not l know that I had so much sleep in me! 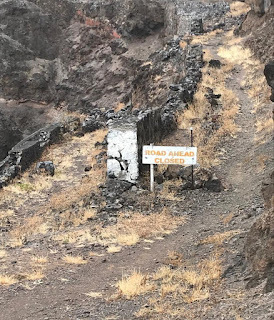 My siesta was disturbed by a call from my university friend and brother-come-businessman, who had heard that we are stuck on St Helena and wanted to send a private plane to fetch us. I assured him that the islanders are hospitable and perhaps God is willing us to rest. I fell back into siesta again and at 13:55 the reception called and woke me up. Joy – another wonderful ‘deacon’, not ordained but diaconal in her varied services – came to check if we wanted any help. She also brought us lovely thank-you notes. Jamestown and the island are small and we are now “known” around town. It takes longer to move from place to place than when we arrived, as everyone wants to say a word or two and inquire how we are. Jamestown, with Jacob's Ladder in background. The four of us re-grouped and decided to climb Sister's Hill as brothers. Sister's Hill is the hill on the opposite side of the Jamestown valley from the hill which we use Jacob's Ladder to climb. We walked to the top and could see the new Rupert's harbour not far from us in the adjoining valley. Our aim was to walk to Rupert's valley from Jamestown but at a dilapidated watchpost we decided to enjoy views of the ocean and the different view of Jamestown. 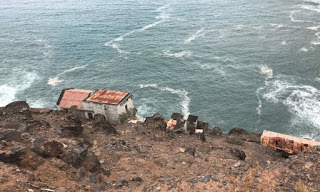 In the area - Munden's Point - three Bahraini dissidents were held by the British at the request of the rulers of Bahrain from 1957 to 1961 - the last prisoners to be exiled to St Helena. After some while we descended. We had hoped to get something from the stores on our way back but they close early on Wednesdays, so we went to one which was still open and bought what we could. It has been cooler and the wind is gone. Talk is that we might leave on Friday but I suspect it might be Saturday – or whenever! After dinner, I still needed about 1430 steps to complete my aim to walk 10,000 steps a day on my mobile phone Stepz App. 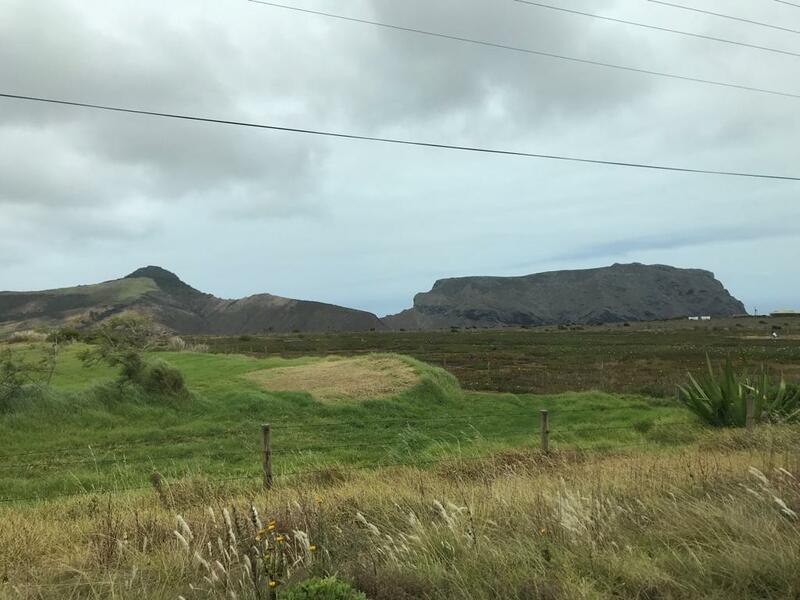 It monitors my daily activities and since being on St Helena my walking is in the green area on the App, meaning 10k or above. So I went up towards the Post Office and back towards the harbour and around the fountain at the gardens and reached my goal for the day. 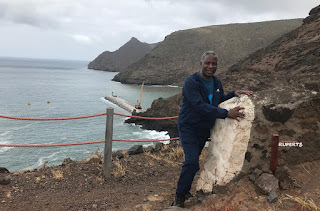 Stranded in the South Atlantic! Bishop Dale braais fish for us. 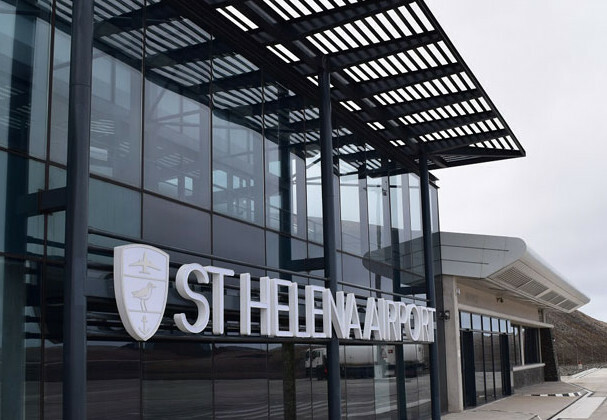 Our goodbyes to the Saints were delayed last Saturday when the weather forced the cancellation of our flight home, resulting in an avalanche of cancellations. Bishop Allan Kannemeyer preached at another parish, while Bishop Stephen Diseko celebrated, and Bishop Dale Bowers went to St Paul's Cathedral. It is a rare happening on the island that you have so many bishops in so many parishes on one Sunday. For lunch we joined Mrs Penny Bowers' parents, Bobby and Pat, and their family as they celebrated their 50th wedding anniversary. (Also see a photo below.) Larry the churchwarden and Ivy Ellick, the Diocesan Registrar, continued to pamper us with attention, for which we are most grateful. On Monday, the four of us visitors took a long walk after breakfast, choosing a new route and covering about 10 km in total, according to my phone App. We walked up the Jamestown valley inland as if going to the next valley, Rupert's, and then at Constitution Corner we came down again past St John's Church and through an area called Maldivia. 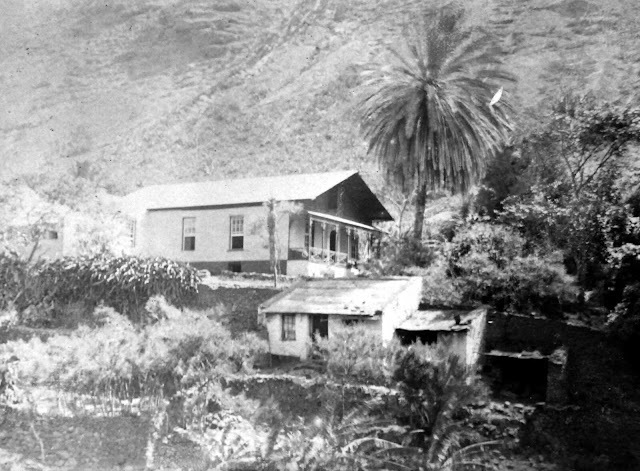 We were tracing Maldivia Lodge (see photo), where Dinuzulu lived during his exile on the island, but we were also just enjoying this safe island on foot. I dedicated the afternoon to admin and correspondence with the office via WhatsApp. 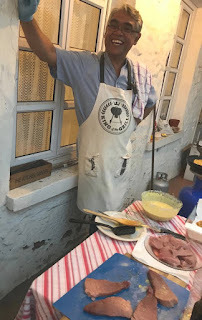 On Monday evening, we joined the Bowers for a fish BBQ. It was a good opportunity to say thank you to this generous family for hosting us and spoiling us. It is windy and cloudy but we are assured that the flight from Johannesburg will land and that we will be able to depart for South Africa. A number of people have said their goodbyes and some said they will also come to the airport. St Helena's cricket team is coming in from Botswana on the flight. The extra days have been relaxing and reminded me to firm up the dates for my pre-Advent retreat soon. Until we meet again, thank you Saints and all who prayed for our visit here. St James Church backs onto Her Majesty's Prison! Celebrating Penny Bowers' parents' 50th wedding anniversary. a school visit with Archbishop Thabo. After breakfast we had Morning Prayer, followed by an official visit to the Governor's office at the Castle in Jamestown. Governor Lisa Honan gave our team an audience and shared her journey and vision, as well as her love for the the island. We then went to the Prince Andrew School, where the primary and secondary school children of the island were all together. The Secretary of Education was present too. Mrs Penny Bowers is the head teacher of the school. They convened a great assembly, the first where all the learners congregated in one hall to worship with us. We sung, read a text, and Bishop Dale and Fr Musgrave of the Roman Catholic Church did a sermon demonstration. I taught the school Miriam Makeba's “Click Song” and we danced together. I shared briefly my education story, as in my book, Faith & Courage, stressing its importance and relating how some in Africa still struggle to attend school. A young Afrikaans boy came up to me after assembly, asked me, “Waarvandan kom die biskop” and gave me a high five. It took me on an emotional journey home. He was touched too and I glad that he stepped out to greet me. After school, I went to the Saints FM and SAMS local radio stations to share our experiences of the island. Leigh and Cyril at the respective stations were such a joy. We had our last meal and lunch with our ecumenical partners and said our thanks and good byes. We were meant to have a boat trip to see whales but it was cancelled due to the wind and very choppy seas. This meant we had our only nap of the week today! Tonight we will have our last meal with the Diocesan Council and clergy, then come back to the hotel and pack. Tomorrow weather permitting and God willing we shall depart. I have my boarding pass at hand. Thank you all for carrying us and the Saints in your prayers. I now pen off my reflections. 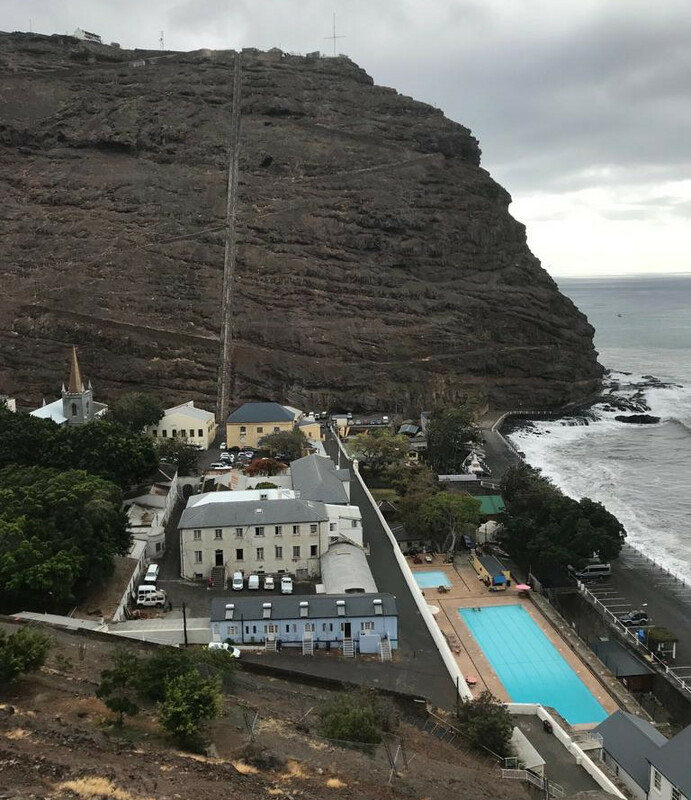 Do visit st Helena to retreat, recoup and reflect. LATE NOTE FROM BISHOPSCOURT: As we prepared the Archbishop's blog post for publication, news came that the weekly Saturday flight had been cancelled due to adverse weather conditions. 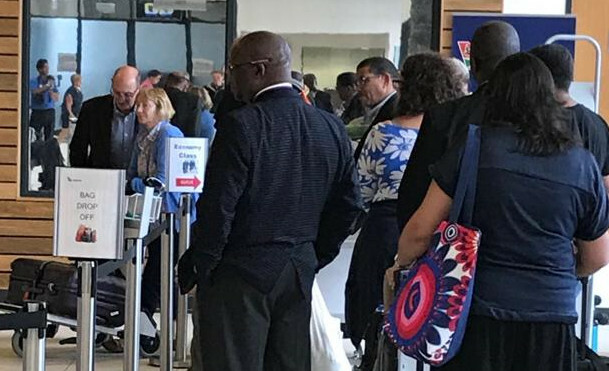 The party is now expected to return on Tuesday, resulting in a number of cancelled engagements, including the Archbishop's participation in London in preparation for the Lambeth Conference. 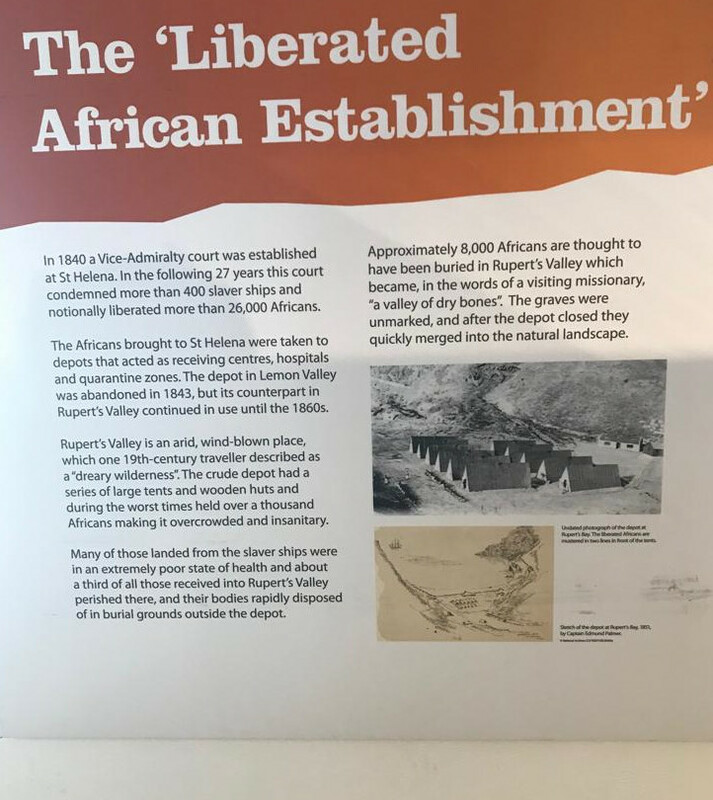 Slaves were transported to and from St Helena before the trade was abolished in the British empire. 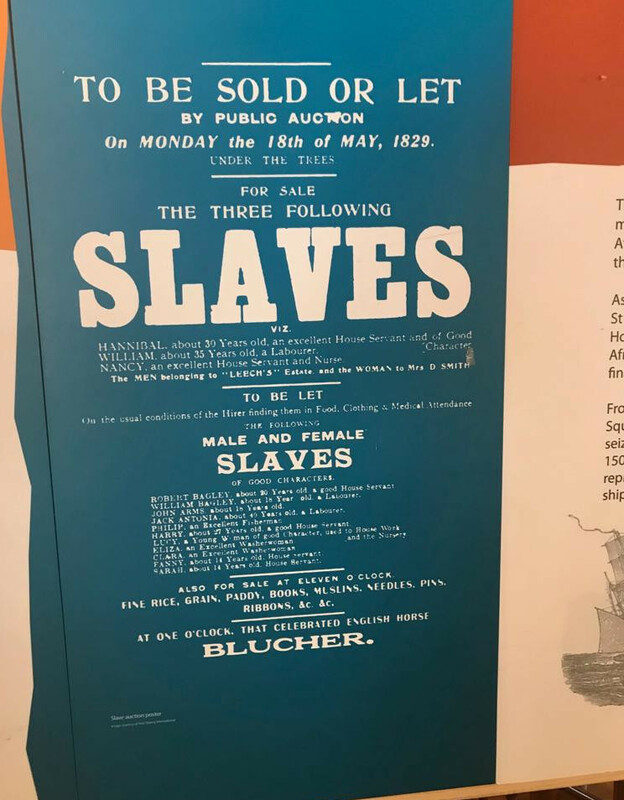 After its abolition, a British naval brig, the Waterwitch, was deployed to suppress the trade, and a naval court was set up on the island to try slavers captured by the navy. 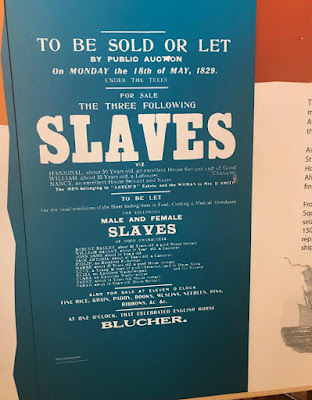 Notice of a sales of slaves. An account of what happened to freed slaves. 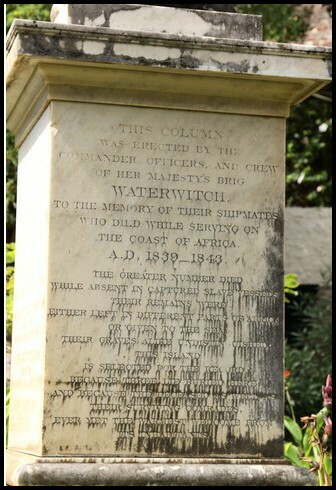 A memorial to the crew of the Waterwitch. May I speak in the name of God, who is Father, Son and Holy Spirit. Amen. Archbishop Thabo at the graves of Dinuzulu's infant sons. After climbing Jacob's Ladder together with our visiting party, I joined Bishop Dale and the Canon for Morning Prayer. Then our episcopal team joined Dale and me for another Bishops' peer training session. We concluded the session on the issue of Church governance and the Bishop's role as the main liturgist in the Diocese. We addressed the question of how scripture, self-knowledge and your response to God's mission enables you as a bishop to create structures in the Diocese that breathe life and release others for mission. Bishop Stephen Diseko reaches the top. 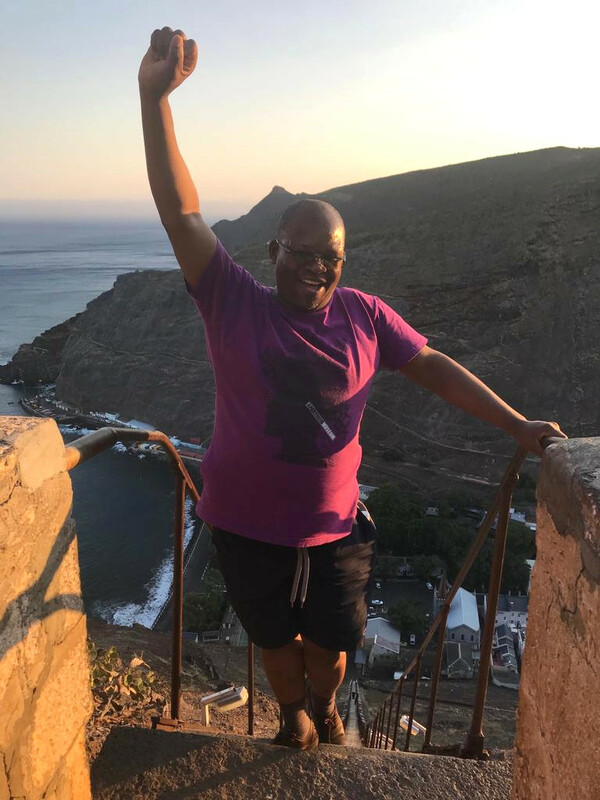 Today all four of us visitors – including Bishop Steve, Bishop Allan and Fr Mcebisi - made the early morning climb, 699 steps up Jacob's Ladder! We continued with our Bishops' peer training today, devoting a session to the Bishop in scripture as we shared our experiences. 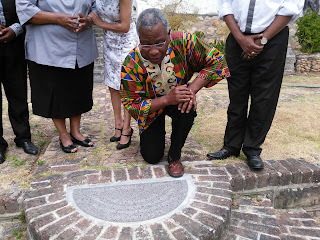 Then we visited Plantation House, the official residence of the Governor of the island, for a special tour in which we learned a lot of history and background. St Helena being a British Overseas Territory, it has its own Legislative Council and a governor who represents the British monarch. We were glad the current governor has opened the residence for the public to visit. Also at Plantation House, we met the oldest resident of St Helena, Jonathan the Tortoise, who at an estimated 186 years is also reputed to be the world's oldest known living terrestrial animal. Then we went to visit Longwood House, the house in which Napoleon Bonaparte lived from 1815 to his death in 1821 after the British had defeated him and sent him into exile. There we refreshed our knowledge about the ravages of war in history. After Morning Prayer at St James' Church in Jamestown, we started our Bishops' peer training at St James' Vicarage with Bishop Dale, touching on the bishop as a person and caring for oneself. The three of us - Bishops Stephen and Allan and I - shared our own varied experiences, which was very fruitful for all of us. Thank you so much for inviting me to this conference today, and thank you also to the visitors and guests here present. Let me acknowledge past Presidents Overmeyer and Titus as well as clergy who are here as chaplains. Archbishop pays tribute to Albertina Sisulu - "One of the mothers of our nation"
A warm welcome to you all on this wonderful occasion where we commemorate one of the icons of our struggle. Welcome especially to you, leaders in Government, and to all the members of the Sisulu family here present. May I speak in the name of God who is Father, Son and Holy Spirit, Amen. It is an honour and a privilege to have been asked to share with you the Word of God on this historic milestone in the life, witness and ministry of the Diocese of Pretoria. Thank you, Bishop Allan, the clergy, your leadership team and to the whole diocesan community for inviting me. Thank you everyone for your warm welcome. Thank you too to those who were involved in the preparations for this day. 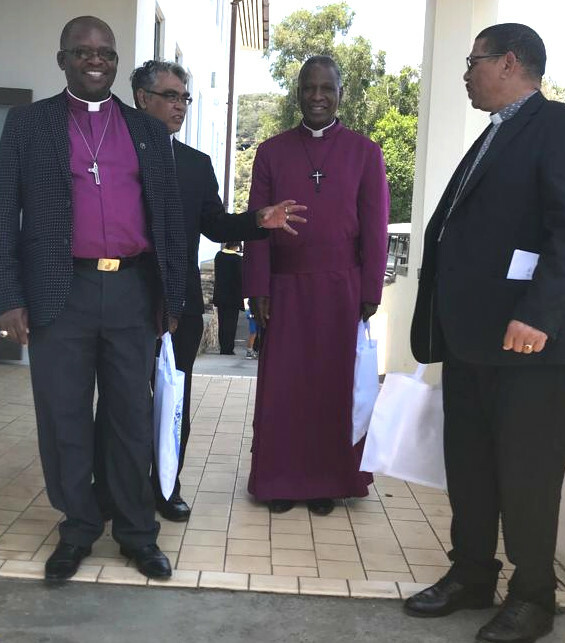 Members of the Provincial Standing Committee of the Anglican Church of Southern Africa have appealed for the full text of Archbishop Thabo Makgoba's op-ed piece in last week's Sunday Times, Johannesburg, to be made more widely available. The text, as sent to the newspaper, appears below. At the end of the page is a link to a scan of the piece as it was published. The Makgobas and our clan, baTlou of Makgoba’s Kloof, Limpopo, know all about the pain of having our land expropriated without compensation. The suffering and challenges of the church elsewhere in Africa turned my schedule upside down for a week last month. Returning from a meeting of the Standing Committee of the Anglican Consultative Council in London, I had to urgently fly to Nairobi at the request of the Council of Anglican Provinces of Africa (CAPA). There I joined other church leaders at the headquarters of the All Africa Conference of Churches (AACC) for an emergency meeting on the situations in the Democratic Republic of Congo and South Sudan. Both countries have been plagued by instability and strife in recent years, and both face huge challenges in the coming months. In the DR Congo, President Kabila has at last agreed to step down and hold elections in December, and now unity and reconciliation are an important priority of the church. When I first became a bishop, I did my month-long “baby bishop” training course in Malawi with the person who now leads the church in South Sudan, Archbishop Justin Badi Arama. Ever since, I have prayed for him, his church and for the freedom of his country. I rejoiced when they attained independence in 2011, but the promise soon evaporated. Two years later, after they had only tasted freedom and independence, two factions of the ruling alliance fell out, and I have previously mentioned the civil war which broke out as a result. A few days before we gathered in Nairobi, the national youth coordinator for the Episcopal Church of South Sudan was shot and killed when his vehicle was sprayed with bullets. At the meeting I listened to stories of interventions by local dioceses to try to end the conflict in this resource-rich country. The refrain was that all those born after 1955, when the first of the civil wars started, are children of war, that they have lived in war but they are determined not to die in war. As we met, peace talks had resumed in Addis Ababa and there was great expectation that a new agreement would be signed. This indeed happened soon after we wrapped up our meeting but in the past agreements have come unstuck so there is still great trepidation – there are international, regional and local actors who do not want peace, because conflict has better dividends for them. At our meeting in Nairobi, we looked at ways in which the region could accompany the church in South Sudan and how the AACC can help the county understand and live in freedom. 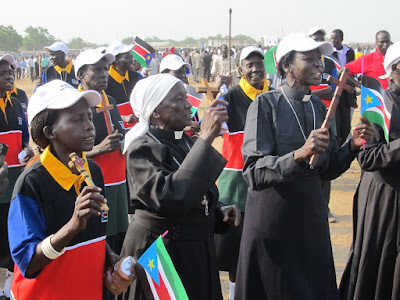 Upon my return to Cape Town, I asked clergy – and now through this Ad Laos I ask you as parishioners: please help me put together prayers, Bible verses and pictures as a resource for daily prayer for peace and freedom in South Sudan, beginning at Advent and running for a full year through to Advent 2019. You don’t need to be a professional, or ordained, or a leader in your parish to contribute: whether it's a line, a poem, a sentence, a song or a picture, just write it down and help your archbishop to pray effectively for this country. The Ven Terry Lester is ACSA's official representative on South Sudan, so you may want to arrange a special meeting or day of prayer with him or others. Since I arrived at Bishopscourt, I have had a group of intercessors who join us regularly for worship – you may also want to also explore having a group of intercessors from the Diocese to pray for peace, justice and progress in South Sudan in their and our lifetimes. Yes, we have our own unresolved social issues of poverty, land, racism, unemployment, inequality of opportunity, crime and others, but I am asking that we also focus on and include these children of God in our prayers. Prayer enables peace within and then we can share this with South Sudan. At a personal level, I am happy to have Manala, my wife Lungi, back after she did a 30-day individually guided retreat with the Jesuits at their retreat centre at St Lucia in KwaZulu-Natal. I have burnt a couple of her pots as I attempted to cook whilst focused on reading, answering emails etc at the same time. I now appreciate her ability to multi-task without burning things! Please continue to pray for our church and its response to what God is up to in his world. Also pray not only for South Sudan and the DR Congo, but for other conflict areas as well, and especially Syria. The debate over land reform in South Africa came to mind on a trip to Chile recently, where I represented the Archbishop of Canterbury on an Anglican Communion delegation investigating whether to recognise the church in that country as the 40th Province of the Communion. May I speak in the name of God, our Redeemer and our Sustainer. Amen. Dear brothers and sisters in Christ, dear people of God; it is a great honour for me to celebrate with you in this service today. This weekend we have reason to thank God for the contributions to the good of humanity of a great, selfless generation of leaders. In South Africa, we give thanks for the life of Mama Zondeni Veronica Sobukwe, widow of Robert Sobukwe, who died in Graaff-Reinet weeks after her 91st birthday. Abroad, we received with shock the news that Kofi Annan, a great African and a Nobel peace laureate who gave new energy to the United Nations to intervene to prevent conflict, has died in Geneva after a short illness. And at home we celebrate the long lives of leaders who are still with us: the 93rd birthday of Mama Gertrude Shope, a former trade unionist and the first leader of the ANC Women's League, and the 90th birthday of Prince Mangosuthu Buthelezi. I am pleased to be preaching at a thanksgiving service for the Prince in Durban today, of which we will write more later. Our prayers go to the families of those who have died, and our best birthday wishes to those veterans celebrating milestone birthdays. 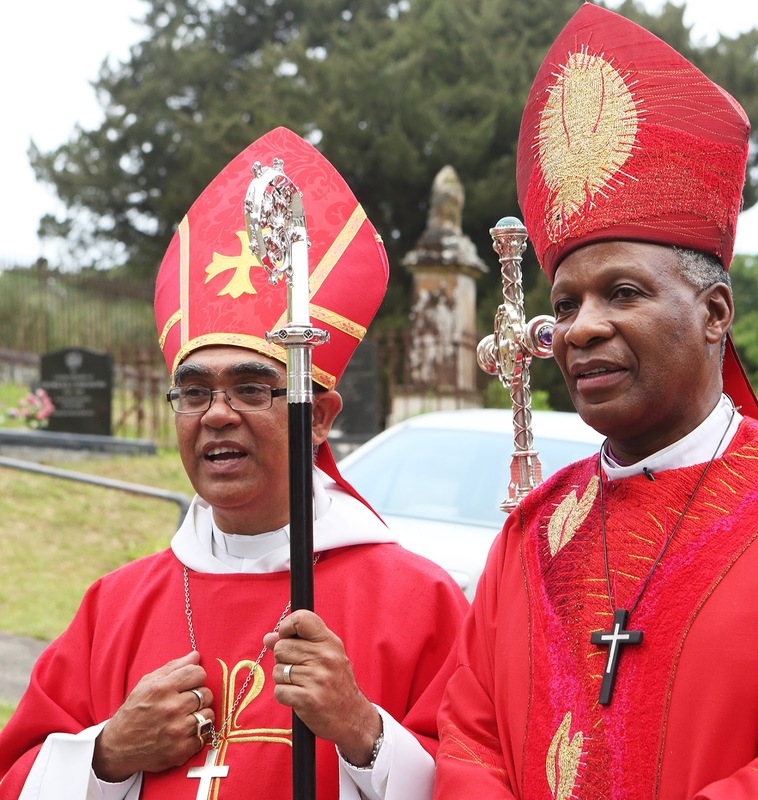 The Archbishop's column in the July issue of Good Hope, the newsletter of the Diocese of Cape Town. July 18 marks the centenary of the birth of Nelson Mandela. This month we celebrate the 100th anniversary of Madiba's birth. As Christians, we know that our God in Jesus Christ, is the God of the living and the dead. In that spirit, we give thanks for Madiba's life. May I speak in the name of God, Creator, Redeemer and Sustainer of our lives, Amen. Bishop Dino, dear brothers and sisters in Christ, dear people of God: it is a great joy for me to be here with you as we give thanks to God for this place of worship. Let me also acknowledge Prince Buthelezi and Fr Ncaca, who presided at Lungi and my wedding 28 years ago. It is an honour and privilege to have been asked to celebrate with you at this historic moment in the life of this community and the Diocese. Thank you, Bishop Dino and your entire team for inviting me. Thank you everyone for the wonderful and warm welcome we received on our arrival here. Thank you also to those who gave of their time and were involved in the preparation for today. I thank God for the unsung heroes and heroines who have kept the gospel light burning here through their lives, their zeal, their prayers and their service and witness. Easter has once again been a busy time for travel: on the evening of Easter Sunday I left to chair a meeting of the Design Group for the 2020 Lambeth Conference. Preparations for the conference are well on their way, and the theme is: “God's Church for God's World: walking, listening and witnessing together”. Thank you for the invitation to be here. It is very encouraging to learn that you are engaged in a process of scrutinising yourselves and your practices with a view to ensuring that you are living up to your duty to serve the public and the nation. Archbishop Thabo Makgoba says the death of Winnie Madikizela-Mandela marks a “changing of the guard” moment in South Africa. He was in London, chairing meetings of the design group for the 2020 Lambeth Conference, when he heard the news. He flew home in time to attend her funeral. He said he was “enveloped with a sense of deep pain and sorrow” when her heard that Ms Madikizela-Mandela had died. “Then I started saying there were good things Winnie did and we need to give thanks to God for those... There are mistakes that she made because life threw a lot of curve-balls towards her... She handled some of those with dignity, but some she really hopelessly failed. Archbishop Thabo Makgoba has asked churches in the Province to join the Thy Kingdom Come initiative, praying for mission and evangelism between Ascension Day and Pentecost - May 10 to 20. Ahead of this year's events, Archbishop Thabo discusses the question “what does it mean when we pray Thy Kingdom Come?” with the Archbishop of Canterbury, the Most Revd Justin Welby. During the discussion, he touches on his experiences as a teenager in Alexandra, Johannesburg, when he was chased by troops and feared for his life. Usually in Lent I try to cut back on my schedule, but this year the busyness of the time leading up to Lent continued and I took on a number of tasks. 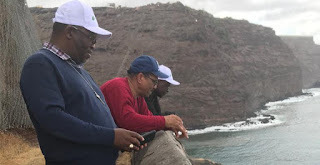 While I maintained a discipline of prayer and reflection, particularly on water justice – praying for more rain in Cape Town and less flooding in the Diocese of Niassa in northern Mozambique – I also engaged the Anglican Communion and society equally. Alleluia! Christ is Risen! He is risen indeed. Alleluia! Brothers and Sisters in Christ, we meet this Easter, joining the whole Communion and faithful Christians across the world in singing this acclamation, and celebrating the Resurrection of our Lord Jesus Christ. 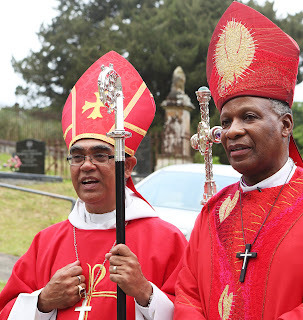 The text of Archbishop Thabo's acceptance remarks appears below the video clip. “In recent weeks, four individuals have either spoken out publicly or contacted my office privately to report experiences of sexual abuse in two dioceses, apparently during the 1970s and 1980s. Friends, colleagues, sisters and brothers in Christ: I greet you all in the name of God, Creator, Redeemer and Sustainer of our lives. The South African writer Ishtiyaq Shukri has written an open letter in which he responds to Archbishop Emeritus Desmond Tutu’s recent stepping down as an ambassador for Oxfam after a scandal around allegations of sexual misconduct. In the letter, Mr Shukri said he was the victim of sexual abuse by Anglican priests and accused Archbishop Desmond of never fully addressing what he claimed was “systematic and institutionalised sexual abuse happening in his own organisation”. After Sudan became independent in 1956, it suffered decades of civil war. Just over six years ago, South Sudan broke away from the north amid great hopes that at last it would find peace. But a little over two years later, South Sudan suffered a new outbreak of civil war and it has not known true peace since. Under pressure from their neighbours, the opposing sides began new peace talks earlier this month, but at present they stand adjourned for an undetermined period. The Democratic Republic of Congo has also not known permanent peace, in their case for the past 20 years. Armed rebel groups proliferate in the east. More than four million people are displaced from their homes. The President has served his two terms but has delayed a new election for two years. A former United Nations humanitarian chief, Jan Egeland, said a few days ago that right now the country faces one of the worst crises on earth, yet no one seems to care. We pray for their politicians, that they will learn how to become servant leaders, dedicated to the interests of their people. And hope helps us to triumph over all. And resolve to build united, peaceful nations. President Zuma's resignation is an acknowledgement that public power is to be exercised on behalf of and in service to the people of South Africa, rather than for the self-service of the incumbent. Ash Wednesday reminds us of our need for repentance and coming closer to God. This is a time during which the whole church of God comes together to begin a journey towards Easter. The beginning of Lent calls us all to fasting and repentance in preparation for Easter, giving up sinful habits and embarking on spiritual discipline. 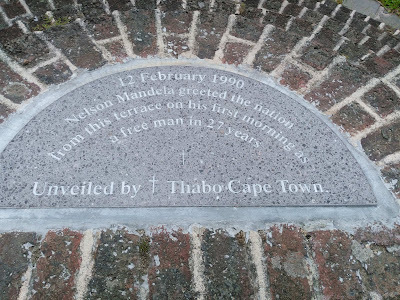 Today, February 12, marks the anniversary of the day in 1990 on which Nelson Mandela woke up a free man for the first time in 27 years, after spending the night following his release at Bishopscourt, the Archbishop's residence in Cape Town. I have today blessed a plaque on a terrace in front of the house, marking the spot from which Madiba greeted the world's media that morning before conducting his first news conference. Archbishop Thabo after blessing the plaque. I remember Madiba's long walk to freedom, as we all do, on many emotional levels. 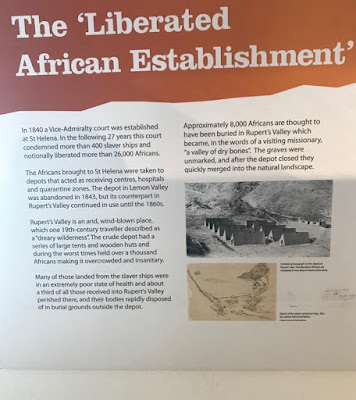 I have often celebrated his release on February 11 by visiting the gates of the former Victor Verster Prison near Paarl. 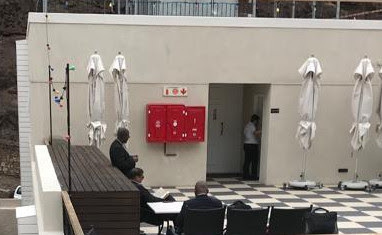 On other occasions I have sat and meditated in the apartment at Bishopscourt which Archbishop Tutu made available to him for his first night away from prison. Those words are as true for us as when they first inspired Madiba. 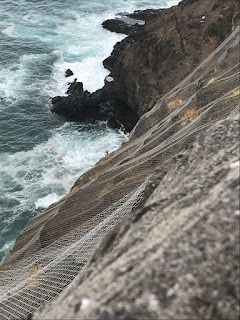 The emotional vertigo of the Zuma decade that has left each of us, our families, our friends, our communities and our nation feeling like we have been on the deck of a ship in the middle of the fiercest storm, is close to ending. South Africa’s destiny now is a choice that we all have in our hands: black hands, white hands, brown hands, yellow hands… rainbow hands. At the same time, I am a realist. Unquestionably, I believe in South Africans and in South Africa. But as the boxer portrayed in the film Rocky Balboa says, let me remind you of something you already know: the world is not all sunshine and rainbows. It can be a very mean and nasty place and I don’t care how tough you are, it will beat you to your knees and keep you there permanently if you let it. Despite the progress made since Madiba's release, South Africans have been hit hard by many things over the past 20 years. We have been slowed down, we have been diverted, and we at times have been stopped by barriers thrown up by morally corrupt leaders who have created a most unequal society in terms of service delivery, education and healthcare. My principal concern is the way in which inequality has remained pervasive, hitting the poor again and again. But, to invoke Rocky Balboa again, the key to winning, surviving and thriving is, in the end, how much you can take and keep moving forward. That’s how winning is done! The 11th of February 1990 was a moment of destiny. Seeing Nelson Mandela elected president of a free South Africa was another. Now, in 2018, we stand at the dawn of a new age where the dizziness of uncertainty can be replaced by the equilibrium of equality. 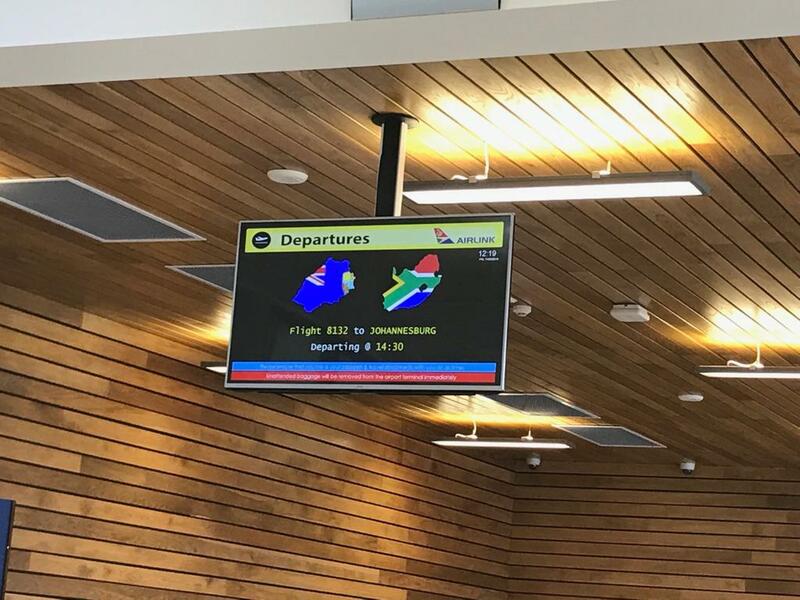 We are again witnesses to a moment of destiny in which a decade of corruption can be replaced with the birth of a South Africa which, despite its many challenges, has a chance to unite, not as a political party but rather as a society committed to becoming a nation of extraordinary achievers of equality. Let me ask: What do you and Nelson Mandela have in common? We are a nation of bridge builders. We will bridge the barriers of bigotry, bridge the chasms of inequality and bridge the barricades which block everyone from having equal opportunities. So, my countrymen and women: start cleaning the tools which we will use to build prosperity, start finding trust again in your hearts, and most importantly, start asking not what South Africa can do for me, but what I can do for South Africa. Please pray for all our leaders, but in particular for the National Executive Committee of the ANC, for Cyril Ramaphosa, the party's president, and for all members of Parliament as they chart the way forward in the coming days. 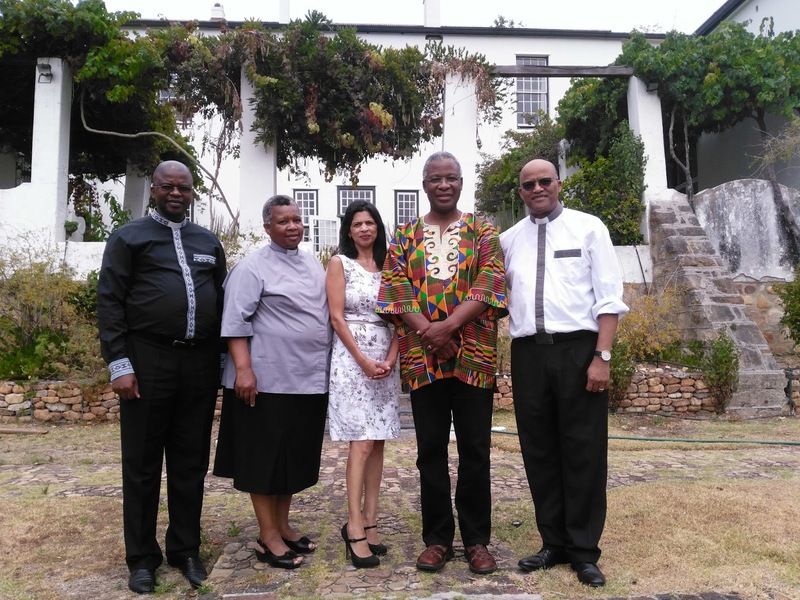 ABOVE: Bishopscourt staff, from left, the Revd Mcebisi Pinyana, the Revd Nobuntu Mageza, Ms Wendy Kelderman, the Archbishop and the Revd Canon Desmond Lambrechts. 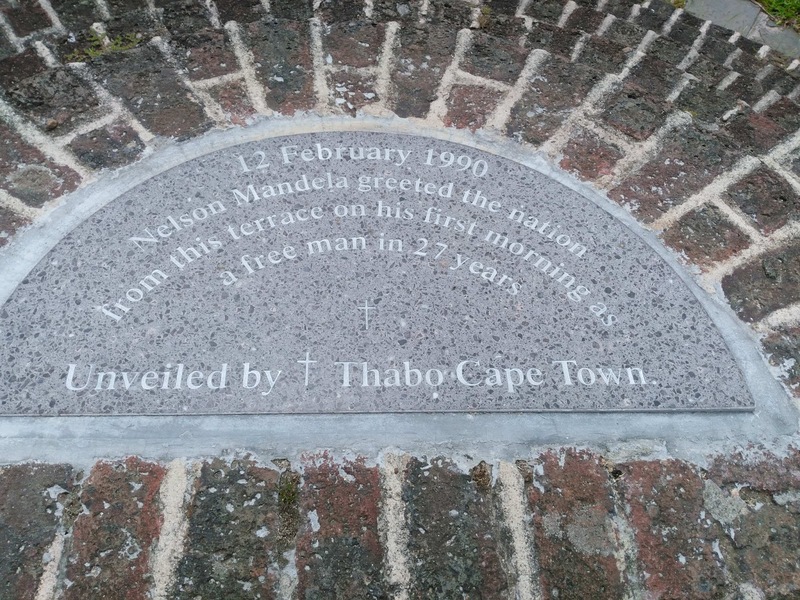 BELOW: The plaque commemorating Madiba's visit to Bishopscourt. 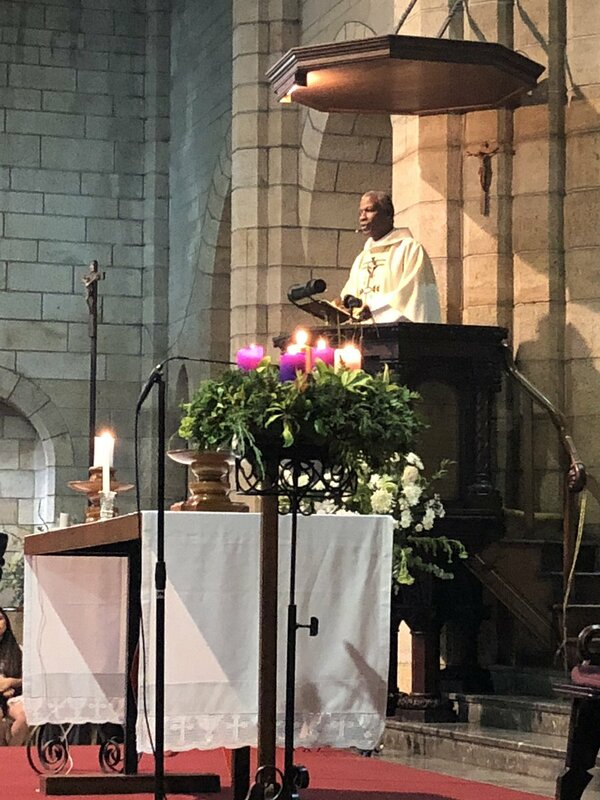 A sermon preached by Archbishop Thabo Makgoba at the 150th anniversary celebration of Leliebloem House, Cape Town, on February 4, 2018. May I speak in the name of God who is Father, Son and Holy Spirit. Amen. It's a great joy to be with you today as we celebrate with Leliebloem 150 years of service to the community. History tells us that in 1868 Bishop Robert Gray established the House of Mercy as a refuge for women in Plein Street. 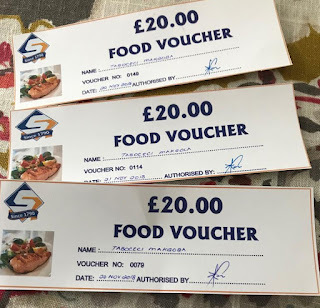 Archdeacon Lightfoot made the initial donation for this initiative and the Society of St John the Evangelist (SSJE) made a generous input to its establishment. 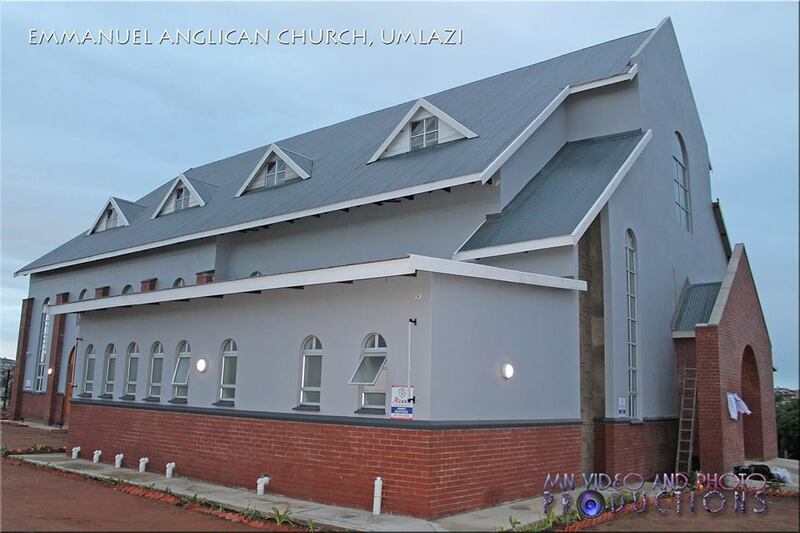 Let me start by congratulating you on 160 years of fruitful ministry, witness and service to God in this place. On Thursday we commemorated the conversion of St Paul. What a colourful history St Paul had, and the cover page of your service booklet gives us a flavour of the colour you reflect. On behalf of the Anglican Church, and on my own behalf, I extend our condolences to Hugh Masekela's nearest and dearest family and friends. Hugh Masekela's legacy is that of an inter-generational institution, someone who across generation after generation articulated our people's experiences and reflected our evolving history through music. The Feast of the Epiphany is so special but here at home in Southern Africa it comes in the middle of our summer holiday and most parishioners are away. We still celebrate it of course, even if we do so on the Sunday following. This year I send you, our parishioners and others who might read this, a short message wishing you good health and renewal as we celebrate the feast of the manifestation of our Lord to all people. May God manifest himself in our lives and wherever we live and work.